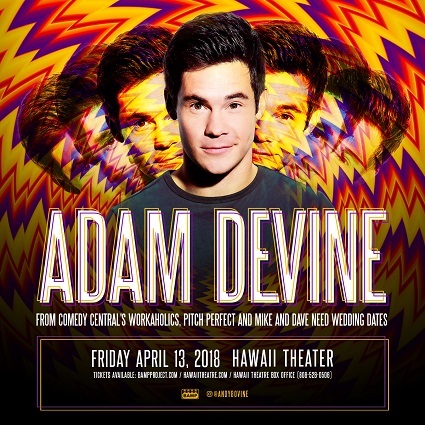 Adam Devine is one of the most sought after young comedians and actors in the comedy world. Adam is best known as a co-creator, writer, and star of the hit Comedy Central show, Workaholics, for which he was named one of THR’s Top 50 Showrunners and one of Variety’s 2013 Ten Comics to Watch. In addition, he can be seen on Comedy Central’s Adam Devine’s House Party, which recently premiered its third season, as well as the recurring “manny” on the award-winning hit ABC series, Modern Family. Adam, along with his frequent collaborators Anders Holm, Blake Anderson, and Kyle Newacheck, are developing a Mail Order Comedy feature with Point Grey Pictures to be released in late 2017. Adam recently wrapped production on the Netlflix feature, When We First Met, which he stars alongside Alexandra Daddario. He can next be seen in the Fox feature, Why Him? starring James Franco & Bryan Cranston and can currently be seen opposite Zac Efron in the Fox feature Mike And Dave Need Wedding Dates. Adam also recently appeared opposite Anne Hathaway and Robert De Niro in the Warner Brothers feature The Intern directed by Nancy Meyers. Last year he reprised his role as “Bumper” in the sequel Pitch Perfect 2 for Universal and starred opposite Taissa Farmiga and Malin Akerman in Sony’s The Final Girls directed by Todd Strauss-Schulson.